I've reviewed a selection of Karma Se7en's excellent body jewellery before - and I have some more pieces to show you today! The quality of the jewellery from Karma Se7en is second to none - it's all unbelievably beautiful and well made. I came straight in from the gym and found the package and immediately wanted to try my earrings in so apologies for the sportswear and slightly gross looking hair. I went and got a double helix piercing last summer and it's finally healed so I got myself some lovely pretty pieces from Karma Se7en to celebrate removing my original bars! Helix earrings are available to view here. Karma Se7en package their jewellery in these little purple gift boxes, and inside the box the jewellery is secured inside a plastic box with a screw lid which is so handy for storing jewellery and is such a god send when travelling - I never lose my earrings anymore! All of the earrings that I have to show you are of a botanical theme. I love flowers anyway but when it gets to spring and summer I go a little bit flower mad. The close up of the Rose Helix Piercing Bar (here) highlights how pretty the detailing on these earrings are. I don't have a photo of this one in my ear as above because I didn't want to irritate my ear by keeping changing out the jewellery - I will definitely take a photo soon though and post it to my Instagram as I can tell that this one is going to look beautiful. I love the fact that the stem part comes out of the back, it's really unique - it wouldn't be comfortable for sleeping in though because of this.. but not all earrings are meant to be slept in! 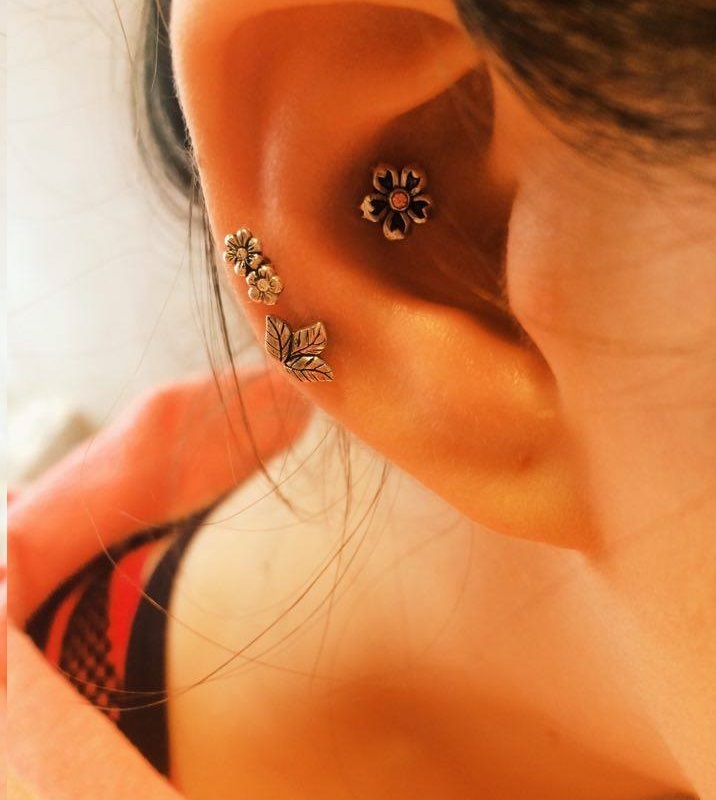 I'm currently wearing the Pretty Flower Upper Ear Stud (here) in my conch as you can see in the photo above. It fits perfectly into the hollow of my ear and looks gorgeous. It's such a nice change from having a plain bar.. my conch piercing is a really old one and I never really change it out to put a pretty earring in, except for perhaps a gemstone one! But I will definitely wear this one in my ear until I get bored of it... which I honestly don't see happening! In my helix piercings, I am wearing the Tea Roses Stud Helix and Cartilage Stud in Crystal Clear (here) and the Leaf Cluster Cartilage Ear Stud (here). I had already intended to wear these two together when I spotted them on the website. It creates such a cute effect - I had my fingers crossed that it would look awesome and I'm more than pleased with how they look. In terms of the practicalities of the earrings, they have surgical steel bars so will not irritate your piercing whatsoever. The accents on the ends are done in sterling silver. The picture above shows that the bars are shorter than what you will get pierced with, but this is completely normal as piercers use longer bars in order to account for any swelling which might occur during the healing process. So definitely wait until your piercings are healed before you go ahead and wear anything from Karma Se7en - definitely pick some things up though so that it's on standby for the exciting day that they're all healed! When I was putting them in, I noticed how easy it was to screw the balls on - I'm hopeless with screwing balls on to my body jewellery and I'm usually trying for ages making my ear all red in the process. But these slid right in and screwed on easily and tightly. I 100% recommend Karma Se7en for high quality, safe and beautiful body jewellery. I'm going to grab some nice septum jewellery next I reckon..